The scale of the delay and cost overrun blighting Nasa's James Webb Space Telescope has been laid bare by a panel called in to review the project. The group believes the final budget for Hubble's successor is likely to climb to at least $6.5bn, for a launch that is possible in September 2015. But even this assessment is optimistic, say the panel members. The head of the US space agency has accepted that "cost performance and coordination have been lacking". Charles Bolden has ordered a reorganisation of the project and has changed the management at its top. Estimates for JWST's total cost to build, launch and operate have steadily increased over the years from $3.5bn to $5bn. Along with the cost growth, the schedule has also eroded. The most recent projected launch of 2014 has looked under pressure for some time. The independent panel chaired by John Casani of Nasa's Jet Propulsion Laboratory (JPL) in Pasadena, California, believes it to be unrealistic. 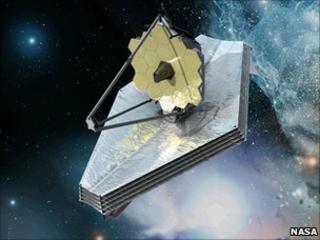 The group was convened to examine the root causes of JWST's problems. It found the original budget for the project to be insufficient and poorly phased, and blamed the management for failing to pick up and deal with the issue. "This is a very large complex project and to estimate something with any real degree of precision that's never been done before is a tough job," John Casani told reporters. "But the bottom line is that there was never enough money in the budget to execute the work that was required." The panel did however commend the technical success of the project. Mr Casani said the technology on JWST was in "very good shape". The telescope was always regarded as major undertaking. Its primary mirror is 6.5m (21ft) across - close to three times wider than Hubble's. The huge reflector will sit behind an even more expansive sun shield, the area of a tennis court. This structure will protect the observatory from radiation from the Sun and the Earth. Whereas Hubble sees the Universe mostly in visible light, JWST will observe the cosmos at longer wavelengths, in the infrared. It will see deeper into space and further back in time, to the very first population of stars. When it is finally built, it will be launched on Europe's Ariane 5 rocket and sent to an observing position 1.5 million km from Earth. It is expected to have a 10-year lifespan. Its distance from Earth means the telescope cannot be serviced by astronauts, as was the case with Hubble. Casani's panel has several concerns going forward and says the project is vulnerable to further delay . It says a total life-cycle cost of $6.5bn and a launch in September 2015 may still be possible, but only if the budget for the project is increased by about $200m in each of the financial years 2011 and 2012. "If those amounts are not available then of course the $6.5bn number is going to move out and the launch date might move out too," Mr Casani said. Chris Scolese, an associate administrator at Nasa headquarters, said the agency was looking at how it could find the necessary money. Efficiencies were being sought, he explained, and he also warned that funding for other science activities across Nasa could be affected as senior managers tried to close the budget gap. "We'll look at what we can do," he explained. "[Fiscal Year 2011] is upon us and we have to work with the administration and Congress to understand what flexibilities we have. "I think it's fair say I doubt that we're going to find $200m. But you have to give us some time to go off and work that before we can really answer that question." The places Nasa will not go looking for the needed funds are its international partners on the project, Europe and Canada. Their contributions are fixed through in-kind provision, such as instrumentation and the launch rocket. "The problems we are dealing with are wholly US; they have to do with how much we pay our suppliers for the components here [in America]," Mr Scolese told BBC News. "We can't go off and look to the European Space Agency to solve those problems. We appreciate their understanding as we work through this and we will make the mission as successful as we all believe it can be." The James Webb Space Telescope is named after the former administrator of Nasa who led the agency in the run up to the Apollo landings.